Understanding when the original documents of the New Testament were written will help us determine how well they have been preserved. The earliest events recorded in the New Testament are those surrounding the birth of Jesus. He was born in approximately 4 B.C. (we date our calendars from the birth of Christ). He lived almost 33 years, and then was crucified. Therefore, since the New Testament tells about His life and death, it could not have been written much earlier than A.D.33. In fact, one book (Acts) tells about things that happened around A.D.30-60. When, exactly, was the New Testament written? We cannot be sure of the exact date when each book was written, but we do know that the entire New Testament was written between approximately A.D.35 and A.D.100. Thousands of manuscripts of the New Testament exist. A “manuscript” is a hand-written copy of an old document that was copied in its original language. Since the New Testament originally was written in Greek, the manuscripts also are written in Greek. Over 5,700 old manuscripts exist that contain all or part of the New Testament. 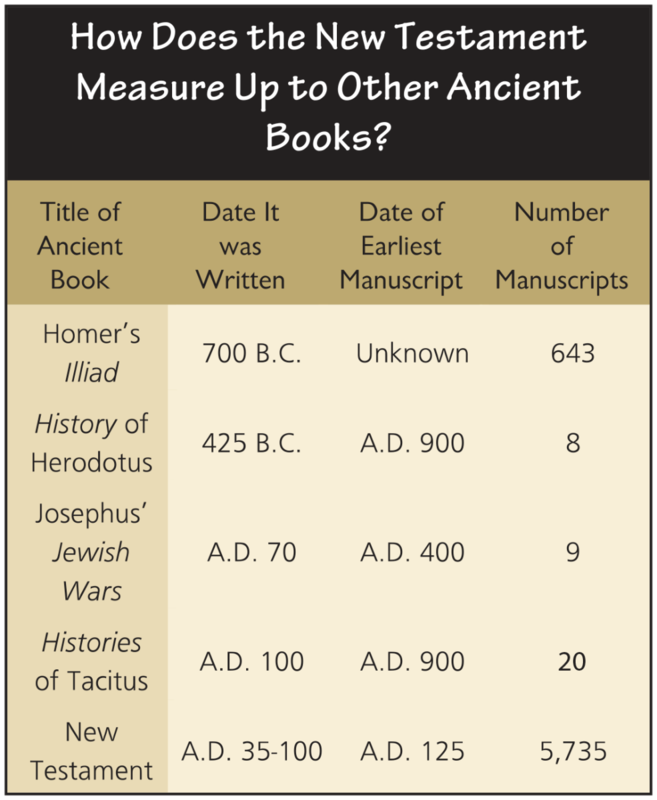 The fact that so many old copies of the New Testament exist is truly amazing, especially when it is compared to other ancient books. What is even more amazing is the time that they were produced. Some have been found that were copied only a few years after they were written. One manuscript known as the John Ryland’s Papyrus has portions of the Gospel of John written on it. It was found in Egypt, and dates back to A.D.125—just a few years after the New Testament was completed.